Is a mirage an illusion? Many a dictionary (inconsistently) asserts that the mirage is an illusion, but it is no more illusory than any other image, such as the view seen through eye glasses or binoculars. But, what about the phantom water that appears over a hot roadway or desert? By having the form of an inverted image, this mirage is reminiscent of a reflection on calm water. If you actually believe it to be water, then it is that water which is an illusion (and you suffer from a delusion). But, the mirage (as opposed to the water) is not an illusion, it really is there. 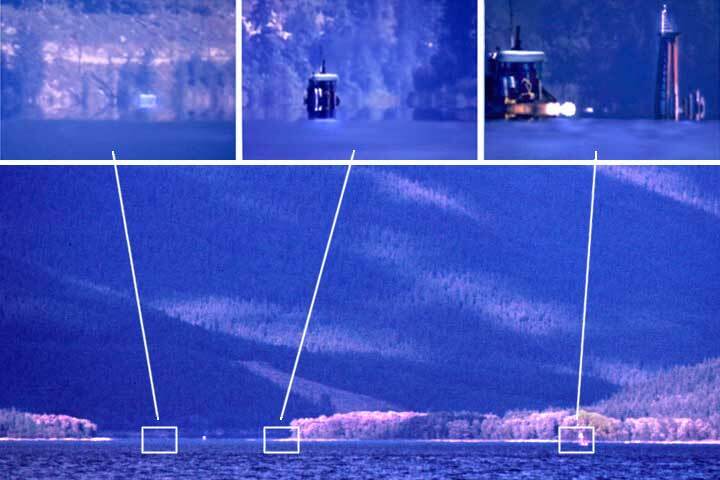 Many people would not expect to see mirages on Kootenay Lake; afterall, don’t you have to visit a desert to see those things? Actually, mirages abound over lakes and oceans; even the name, itself, was coined by sailors. the atmosphere behaves as a lens. Mirages are reminiscent of images seen in a carnival house of (twisted) mirrors: they can show magnification, shrinking, multiple views, even all of these in different parts of the scene simultaneously. However, the mirage only distorts the scene in one dimension. When a mirage is seen over the Lake, the distortions only appear in the vertical; the horizontal is unchanged. In the picture of the Harrop Ferry (below) the Ferry appears twice in the vertical—right way up and upside down—but it is not swapped end for end, nor duplicated side by side. Confusion One of the enjoyable aspects of mirage watching—beyond the interesting shapes, that is—is the delightful confusion that arises when one pretends one is looking at an object rather than an image, for objects and images obey different rules. Objects don’t spontaneously change size, or vanish from view, and dense objects don’t float in the air or on water, but images are not so constrained. The result is that an mirage interpreted as an object may behave in unexpected ways. Any lens operates by the differential bending of light: some rays are bent more than others with the result that an image might appear larger than the object (as it does in a telescope). Air can bend light in somewhat the same way as does any other lens; in each case the bending (refraction) occurs as the light changes speed. With one’s eye glasses, this happens abruptly as the light enters or leaves the glass. In the atmosphere, it happens gradually as the light travels from a region of one air temperature to that of another. The most rapid changes in temperature usually occur near a surface, such as the ground or water. The picture of the Harrop Ferry (below) was taken on a very cold January day: the temperature about a meter above the Lake was around -10C; the surface of the Lake was unfrozen and so was about 0C. So over that small height of one meter, air the temperature dropped smoothy by 10C, with most of the decrease occurring in the lowest 10cm or so. Often the change of temperature with height is not as dramatic, but the mirages produced are similar. Mirage watching Just as bird watching is more satisfying when using binoculars, so is mirage watching. Mirages subtend a fairly small angular extent—usually less than a half degree (the width of the Sun or Moon)—so magnification improves detail. Various types of mirages can form bearing names such as looming, sinking, towering, stooping, shrinking, inferior, superior, two-image, three-image, Fata Morgana, and they can occur in combinations. They can all be seen on the Lake (well, I haven’ seen the Fata Morgana here yet, but that is probably from lack of looking). All of the pictures below are of one type: the two-image inferior mirage. In time, I will add more mirages and increase the variety. Harrop Ferry This is a two-image inferior mirage: two-image because the ferry is seen twice, right way up and upside down, and inferior because both images have been displaced downwards: in the absence of a mirage the ferry would be seen slightly higher. While the inverted image is reminiscent of a reflection on calm water, the Lake is much too rough: the image is produced in the air. 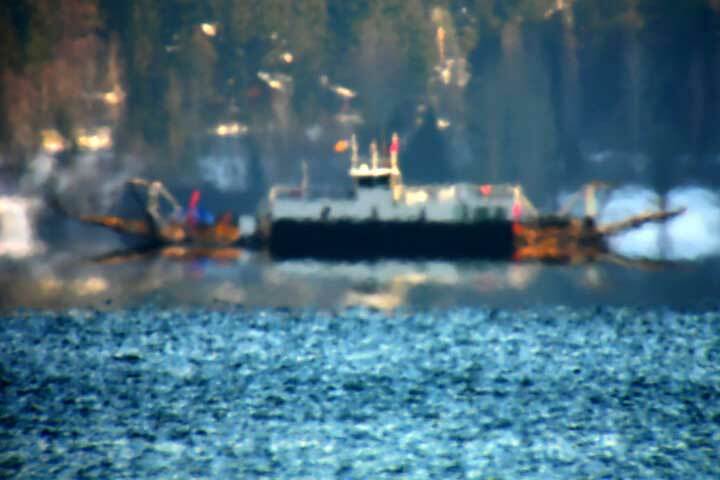 This picture was taken through a telescope from the beach at Kokanee Creek Park, over four kilometers from the ferry. In the bottom meter above the water, the temperature decreased a dramatic 10C. Tugboat This picture was taken on an August morning in 1972 when the K.F.P. tugboats still plied the Lake. Early in the day, the water is somewhat warmer than the air. Shot from Shannon Point, it shows the tug going up the Lake: passing the Seven-mile dolphin (upper right) at distance of 3 km and finally entering the Nine-mile narrows (upper left) at a distance of about 7 km. A cover picture (bottom) shows roughly where the tug was in the telephoto views. The sequence reveals the way in which the two-image inferior mirage changes as the object moves farther away. In the first picture the hull (and a tiny part of the bottom of the dolphin) is seen inverted. In the second picture the hull has vanished but the cabin is seen right way up and inverted. In the final picture the hull and cabin have both vanished, and only the white roof is seen right way up and inverted. It is as if there were there were a mirroring surface below which nothing can be seen; a surface which starts at the visible edge of the water and climbs with increasing distance. The visible edge of the water is called the optical horizon, it is the most distant point the Lake surface can be seen; the ascending optical surface is called a caustic. The position of the caustic depends upon the height of the viewer’s eye; kneel down and the optical horizon moves closer and even larger distant objects vanish below the caustic. Obviously, reflections don’t behave this way. (Incidentally, the stubby pilings to the right of the dolphin are the remains of an older dolphin which collided with a log boom). Nine-mile narrows This picture was taken on the same cold January day as that of the Harrop Ferry (above). The brisk wind not only made the Lake rough, but gave the turbulence which gave the mirage a somewhat motley appearance. Even just beyond the optical horizon, some of the waves are high enough to appear above the caustic and so appear as isolated dark spots floating above the rest of the Lake. The beaches on either side of the Nine-mile narrows have disappeared below the caustic, as has the distant shoreline along Crescent Bay. Above that, however, the road is doubled. Walking on water Although, I took this picture at the Coast, I have seen (but not photographed) the same thing on Kootenay Lake: this picture will have to do for the moment. The two lads apparently walking on water are, of course, doing no such thing, but obviously the image is not constrained by the same rules as objects. The lads were walking along a point of sand extending into the water, but the sand and their feet were below the caustic. 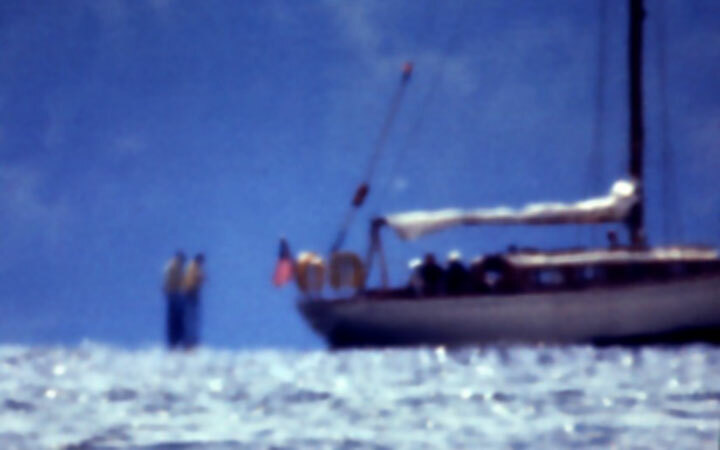 The compelling visual impression is that they were sauntering across the surface of the water towards the sailboat (which was in the water beyond the sand point).